Today I deserve a pat on the back. I’ve now moved past the usual experimental beef stews and bolognese sauce in the Instant Pot. At the heart of things I love Chinese food and Chinese noodles are the one thing I really miss in my low carb lifestyle. 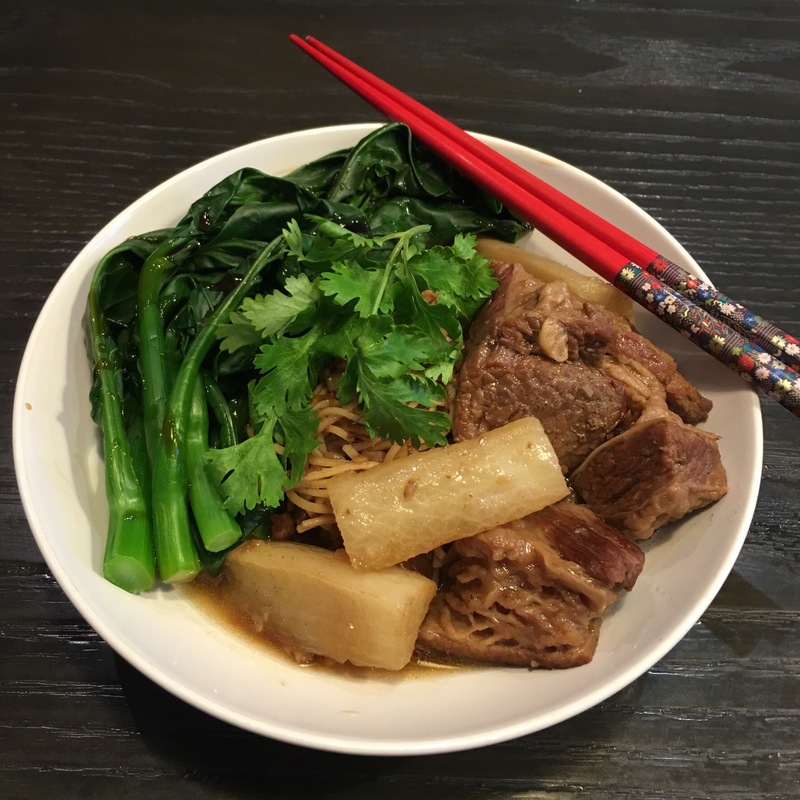 More often than not, as a family we tend to gravitate to dim sum or noodle restaurants in Singapore and usually either hub or one of the kids will order braised beef noodles. I usually nick a piece or two of the braised beef chunks or beef tendon, but will usually skip this dish because of the noodles. It was a super hectic Sunday with the family headed in 4 different directions at any one time. The kids had school (yes, even on a Sunday!) and tuition classes and I had rounds and a work-related event, and hubs was valiantly chauffeuring the kids across Singapore. The challenge today was that I had to fix dinner but the afternoon event was from 3-6 pm, leaving an hour before and after that to get dinner ready. I thought I was on an episode of Chopped or Iron Chef, but I would certainly have been chopped because I was driving out of the house when I had to call kid#2 because I had forgotten to turn off the stove and the Instant Pot when I ran out of the house. So tonight’s culinary adventure was making braised beef brisket and tendon in the Instant Pot. I should stop being so surprised at how efficient the Instant Pot is. The beef brisket and tendon would usually take at least 2-3 hours to braise, and it literally took less than an hour to finish the dish. 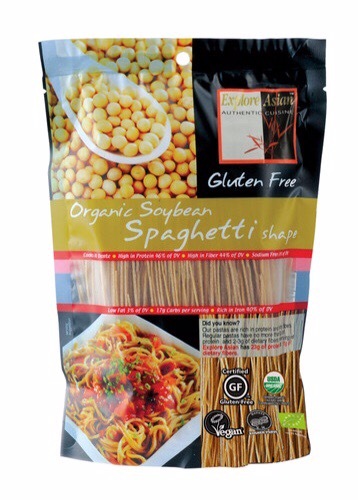 For the noodles, instead of using wonton noodles, I used a soybean spaghetti noodle that I had bought from Netrition, which contains only 8g carb in a 4 serving bag. These noodles are thin and reminiscent of wonton noodles but of course lacks the chewiness of wheat and gluten in the real thing. Not bad however and I would order this low carb pasta again. Anyway I think I did nail this Cantonese dish. 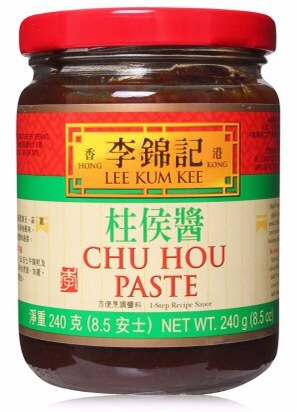 The only thing that was not quite low carb was the Chu Zhou paste, which is a convenient Cantonese paste made from soybeans, garlic, ginger and sesame seeds. Myfitnesspal lists 1 tbsp of Chu Zhou paste to have 4g of carbs. I guess spread out through the whole dish it isn’t that bad but who knows, maybe one day I will figure out how to make it from scratch. Turn on the Instant Pot and put into “sauté” mode. Put the vegetable oil into the pot and sauté the ginger till fragrant. Add the beef brisket into the pot and brown the beef pieces on all sides. When browned, add the garlic and continue to sauté for 2-3 minutes. Add the beef tendon and stir through. Place the star anise, peppercorns and bay leaf into a spice bag and put into the pot. Add the beef broth, soy sauce, oyster sauce, Chu Hou paste, Shaoxing wine, fish sauce, white pepper and sugar substitute. Cancel the sauté mode. Make sure the brisket and tendon pieces are all immersed in liquid. Close the pot and put the valve into sealed position. Put the Instant Pot on manual mode for 45 minutes. When done, you can do NPR or QPR depending on how much of a rush you are in. Put the daikon into the pot and close the pot again and pressure cook for another 10 minutes. In the meantime, bring a large pot of water to boil. Blanch whole sprigs of Kai Lan for about 2 minutes, then remove and set aside. If you want you can toss with a dash of oyster sauce. Prepare the soybean noodles according to instructions. In shallow bowls, plate the noodles, followed by the beef brisket and tendon and daikon on top. Put several pieces of Kai Lan on the side of the noodles and top with some coriander leaves. Serve hot. Made this for dinner last night—YUM! Thanks for the recipe! Thanks so much Dorothy! Glad it worked out well.